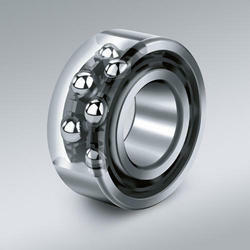 Double row deep groove bearing embodied the same design principle as that of the single row deep groove ball bearings. The bearing has a lower axial displacement than it occurs in the single row deep groove ball bearing. These bearings are capable of carrying substantial thrust loads in either direction and due to double rows of ball they are also capable of carrying high radial loads too.